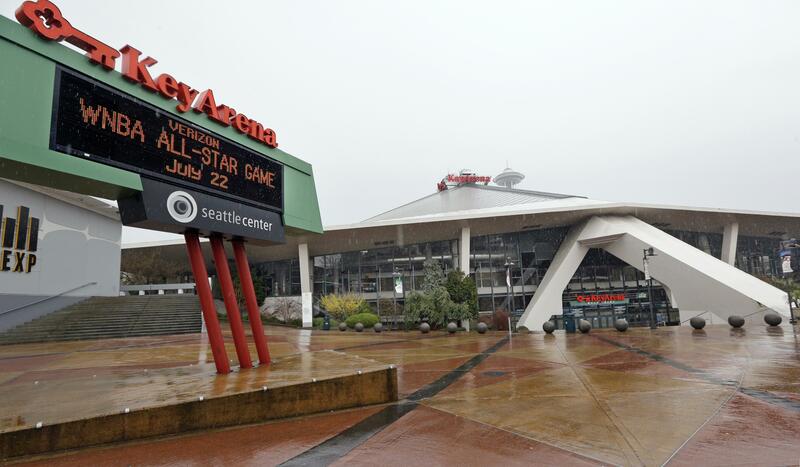 UPDATED: Tue., July 31, 2018, 4:44 p.m.
SEATTLE – Renovating KeyArena will cost $100 million more than previously expected as project leaders attempt to make it fully ready for an expected NHL franchise and possibly a future NBA team. Oak View Group announced Tuesday it had selected Skanska and AECOM Hunt to partner together as the general contractor for the $700 million project. The project was originally expected to cost $600 million, but Oak View Group CEO Tim Leiweke said costs increased for several reasons, including putting in permanent locker rooms for the expected NHL franchise, the WNBA’s Seattle Storm and a permanent locker room for a potential NBA franchise. Leiweke said there was also an additional 50,000 square feet added for storage and a premium club space was added at the top of the building with a view of the Space Needle. The project remains on track for construction to begin this fall with an ambitious timeline of having it completed by fall 2020, in time for an NHL franchise to begin that season. The final event scheduled for the arena is an NBA preseason game between the Golden State Warriors and Sacramento Kings on Oct. 5, with the building being turned over to OVG shortly thereafter. That timeline is subject to final approvals by the city of Seattle. It may also fall in line with the approvals for an expansion NHL franchise, which could come from the league sometime in the fall. “We get to tell our story to the NHL this fall and I’m an optimist,” said Tod Leiweke, president and CEO of Seattle’s prospective hockey franchise. As part of Tuesday’s announcement, the team in charge of the renovation unveiled some of the ways construction will be done. The new building will have a capacity of 17,400 for hockey and 18,600 for basketball. The project is somewhat limited because the KeyArena roof has received historical landmark status and cannot be touched during construction. Project managers unveiled designs for the revamped building Tuesday and showed how new supports will be constructed that allow the entire arena to be gutted and rebuilt without the roof being impacted. The construction plan calls for the floor of the building to be dropped 15 feet from its current depth and expanded outward to create the amount of square footage needed to construct a modern arena with all the needed amenities. Tim Romani, CEO of CAA ICON, the project manager for the arena redevelopment, said the fact that an entirely new arena is being built underneath the roof raises costs but also makes the process more straightforward than if they were trying to save parts of the existing building aside from the roof. “It’s complicated, but it’s simpler when we’re not trying to keep other pieces,” Romani said. Published: July 31, 2018, 2:15 p.m. Updated: July 31, 2018, 4:44 p.m.